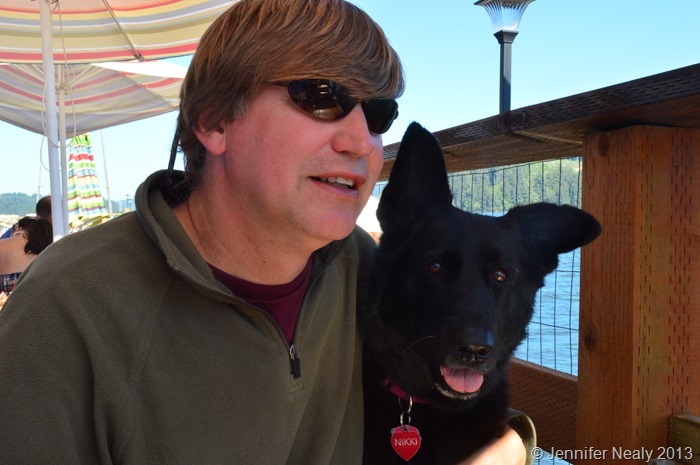 Our next stop along the Oregon coast was another tiny town – this time Winchester Bay. With a population just under 400, and a total area of about 3 square miles, there really isn’t a whole lot going on other than crabbing and riding on the sand dunes. But there is a very nice county-run RV park right on the bay, the Winchester Bay RV Resort, and that is where we stayed for 5 nights. It’s a very popular park, and since we only made reservations a couple of weeks prior, we had to move spaces once during our stay. 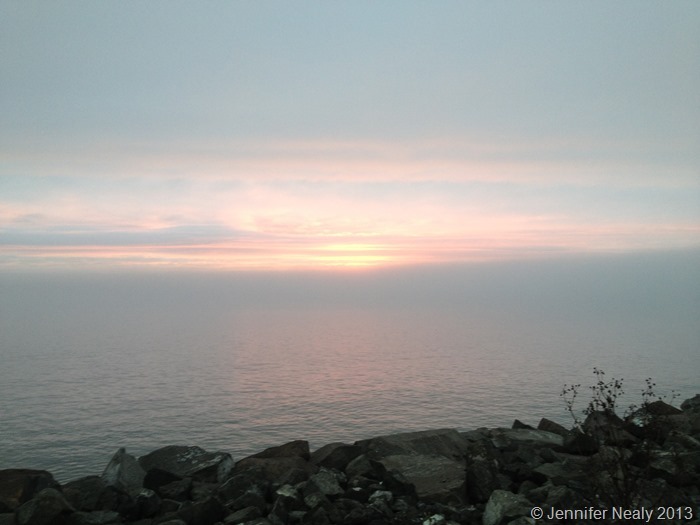 But we had two great sites – our first one looked right out over the bay. We stayed in that sight for 3 nights, and to be honest, we were pretty lazy while we were there. It was so nice and quiet, it was hard to motivate to go anywhere. We spent a lot of time sitting outside, enjoying a camp fire, and looking at the water. 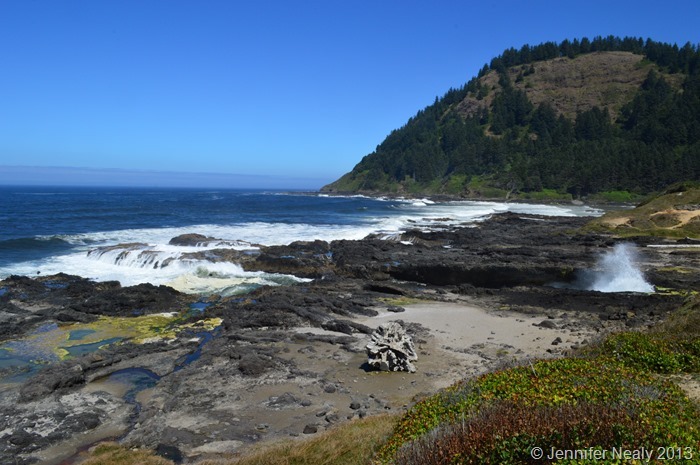 We did manage to get out and do some more sightseeing along Highway 101 one day. 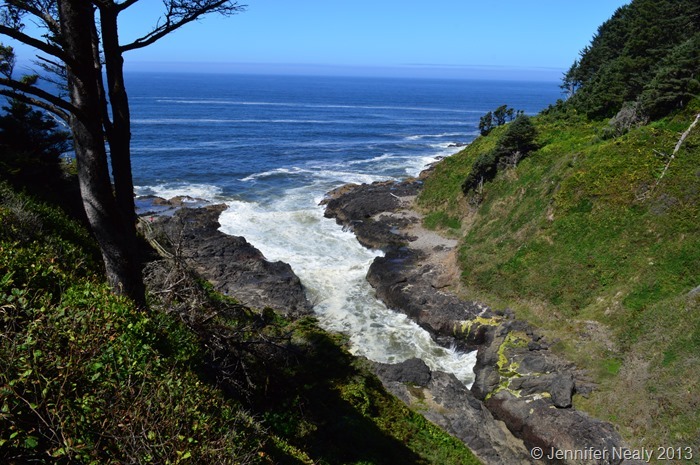 We drove north to Cape Perpetua, and saw the Devil’s Churn, which is a long crack in the rocks on the coast that fills with water as the waves come in. I heard that it can get really wild when the waves are big, but it was relatively mild the day we were there. 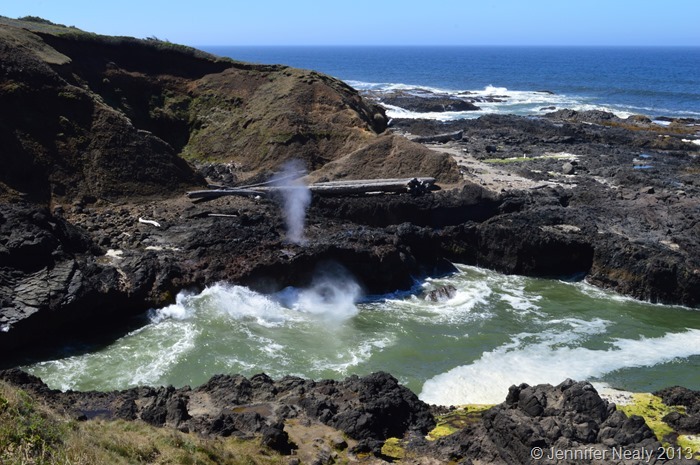 Just a little further south along 101 is Cook’s Chasm, and an ocean geyser named the Spouting Horn. As the tide comes in, the water is forced up through a hole in the rock and shoots into the air. There is a lot of lava rock in this area, and the water fills in between the gaps as the waves come in. There is a lovely paved path you can walk down and take in the sights. It’s definitely worth pulling over and taking a look if you’re in the area. 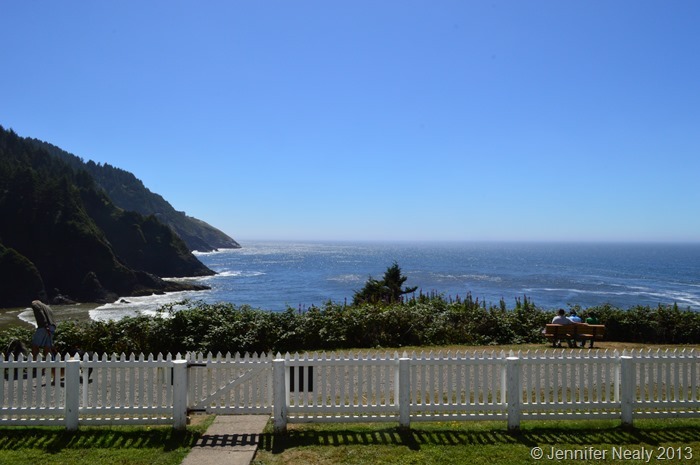 Our next stop as we continued south was the Heceta Head Lighthouse. 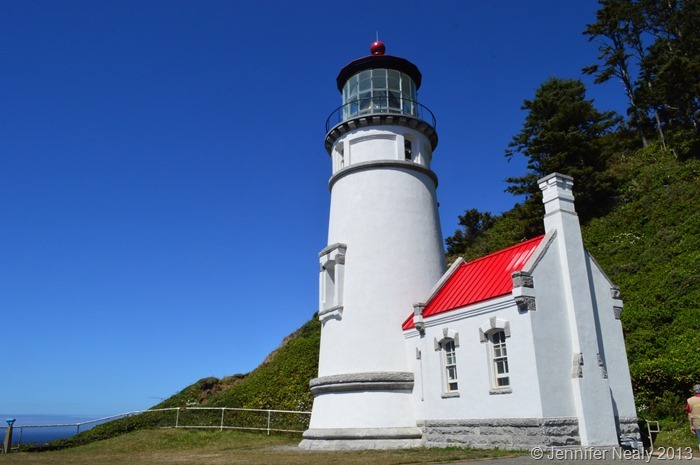 I had no idea there were so many lighthouses on the Oregon coast, and each one is a little different. 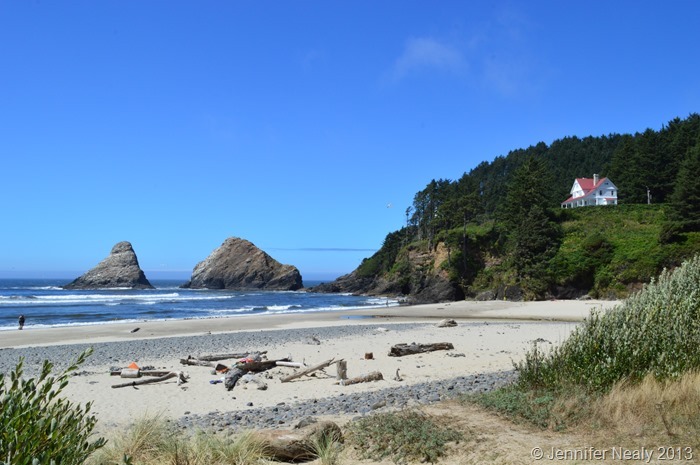 Heceta Head is the strongest lighthouse on the Oregon coast – its beam is visible for 21 miles! 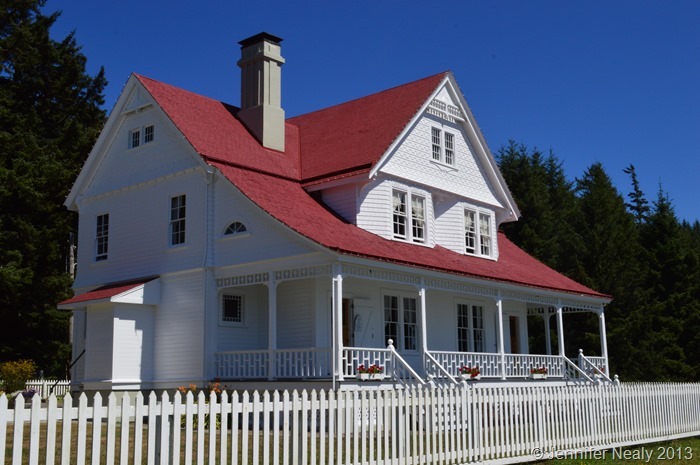 The assistant light keeper’s property is still on the premises, and it currently operates as a bed and breakfast. The main light keeper’s house was sold several years ago, and was moved to a nearby town where it is currently used as a restaurant. This is the view from the porch of the lightkeeper’s house – at least for a couple months of the year when the weather is nice and clear! We ended our day with dinner in Florence. Deas and I couldn’t agree where to have dinner, so we decided to go two places – ICM for appetizers, and the Waterfront Depot for dinner. We sat outside at ICM over looking the river and had clam chowder and crab cakes. The restaurant is dog-friendly so we brought the pups. Dinner at the Waterfront Depot was excellent. By 5:30 the restaurant was packed, and since we didn’t have a reservation, we sat at the bar. 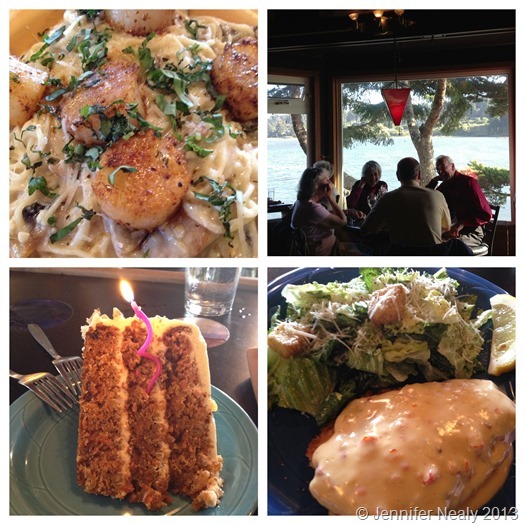 I had scallops and Deas had crab-encrusted halibut. The bartender overhead us mention that my birthday had been a few days prior, and he put a candle in the dessert that I ordered. If we’re ever back in this area we’ll definitely try to spend a little more time in Florence. 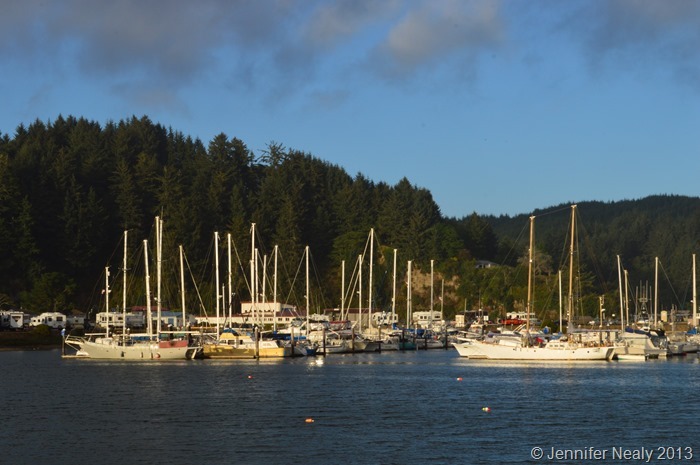 The last two days at the RV park we had to move to other side of the park – instead of overlooking the bay, we overlooked the marina. It’s hard to say which view we enjoyed more. We went to every lighthouse on the Oregon Coast, except of course, “Terrible Tilly”. Great pictures. Such memories and great to see your pictures. Thanks for all of your sweet comments – I’m glad it’s helping you relive some of your good memories! 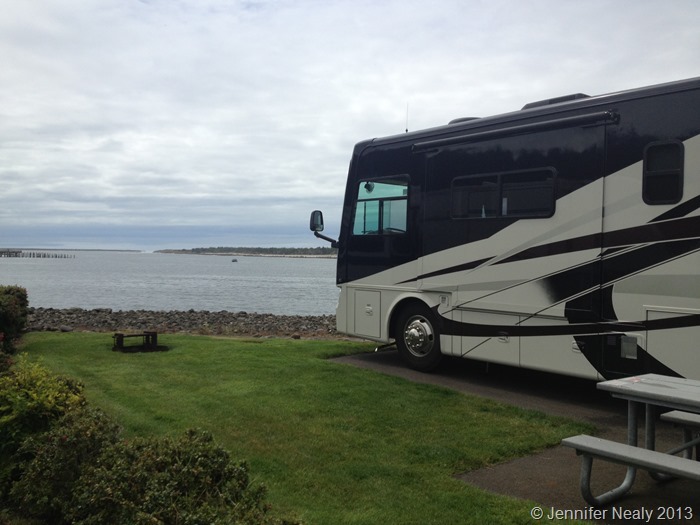 Nice score on the RV park…both sites have great views! We may have to check it out. Just yesterday, I was reading about the B&B lighthouse and it looked great. We learned about it from Wheeling It’s blog. There’s not a whole lot going on in the area but it’s a great place to chill for a few days. There are interior sites too, so if you go request one of the water view sites, and you’ll probably need a reservation. $42 for full-hookup sites with a view! The lighthouse was great – it had the best tour of anyone of the ones we’ve visited so far. Now I know where that restaurant is!! Yum, yum!